A battleship is a large armored warship with a main battery consisting of heavy caliber guns. Battleships are larger, better armed and armored than cruisers and destroyers. After the old wooden sailing ship of the line became obsolete around 1870, battleships were the new capital ships, the largest armed ships in a fleet. They were used to take command of the sea, and represented the apex of a nation's naval power. The development of explosive artillery shells made the use of iron armor plate on warships necessary. In 1859 France launched Gloire, the first ocean-going ironclad warship. She had the profile of a ship of the line, cut to one deck due to weight considerations. Although made of wood and reliant on sail for most journeys, Gloire was fitted with a propeller, and her wooden hull was protected by a layer of thick iron armor. Gloire prompted further innovation from the Royal Navy, anxious to prevent France from gaining a technological lead. Meanwhile, smaller ironclad warships became the main tool of the United States Navy in river combat in the American Civil War. In 1906 the new HMS Dreadnought made all older battleships obsolete. Battleships also gave support gunnery (that is: shooting targets on coast or inland) for amphibious invasions. They often served as flagships. However, their main role was to limit the enemy's use of the seas for whatever purpose. The value of the battleship had been questioned, even during their heyday. During World Wars I and II, the activity of the German surface fleet was limited by the Royal Navy, which had more battleships. On the other hand, submarines and planes could be produced in quantity, and they became more important in naval warfare. There were few decisive fleet battles between battleships. They were vulnerable to the smaller, cheaper weapons: the torpedo, the naval mine, and later aircraft and the guided missile. Against these the battleship's large guns and thick armor were not effective. Battleships were no longer made, and faded from use. 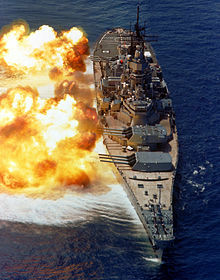 The United States Navy used battleships until 2004, when the last ones were made into museums. Aircraft carriers and large submarines took their jobs. ↑ O'Connell, Robert J. (1993). Sacred vessels: the cult of the battleship and the rise of the U.S. Navy. Oxford: Oxford University Press. ISBN 0-19-508006-8. ↑ Keegan, John 1993. Battle at sea: from man-of-war to submarine. London: Pimlico. This page was last changed on 10 February 2018, at 15:02.